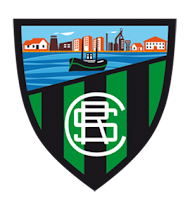 Sestao River Club is a football club who were formed in 1996; following the liquidation of Sestao Sport Club, who come from from the town of Sestao, which is located on the south bank of the Nervión, a few miles west of Bilbao in Spain’s Basque country. Sestao Sport Club had been formed in 1916 playing at Campo Municipal de las Llanas. After competing in local and regional football, Club became members of Tercera División for the 1929-30 campaign, the third level of Spanish football at the time. After the Spanish Civil War Sestao played in Segunda División in the 1939-40 season before dropping down to the third tier after just one season, where they remained until the end of the 1953-54 season when they became champions of Grupo II; winning promotion back to Grupo I of the second tier. In 1960-61 Club were relegated after losing their play-off game on aggregate to FC Cartagena. Sestao remained in the Tercera División until 1977-78, when the leagues were reorganised and Club were placed in Segunda División B. After a series of high league finishes in the early 80’s Club were promoted as champions in 1984-85 to Segunda División. After a few mid table finishes, Sestao narrowly escaped relegation in 1991-92, before they went down the following campaign. A second place finish in Grupo II of Segunda División B in 1993-94 saw Club enter the play-offs thanks in part to the goalkeeping of Tito Subero; where they missed out at the group stage. 1994-95 finished happier with a third place berth meaning another play-off campaign thanks to the goals of Aitor Bouzo. Sestao went on to win the four team Grupo A, and promotion back to Segunda División as a reward. However, success came at a price as Club hit severe financial troubles. Players remained unpaid and the club was dissolved after finishing in the relegation play-offs. Sestao River Club was formed to take Club’s place at Las Llanas to play in the fifth level Biscaya División de Honor before winning promotion in 1998-99 to Grupo IV of the fourth level Tercera División. A third place in 2000-01 was followed by a runners-up berth in 2001-02. Those seasons set up a platform for the 2003-04 campaign as River were crowned as Grupo IV champions to win promotion to Segunda División B.
River finished second bottom of the Grupo II table and were relegated just one year later. However, they bounced straight back to the third tier at the first time of asking in 2005-06. This time Sestao were there to stay. After three seasons of steady finishes, River were relegated in 2009-10. A third place finish in Grupo IV of Tercera División in 2010-11 led to a place in the play-offs; from where the team won promotion back to the third tier once again. River won the Grupo II title of Segunda División B in 2013-14 to reach the promotion play-offs, thanks to the goals of the league top scorer, Jito. River missed out on a return to the second tier of Spanish football after drawing 5-5 on aggregate with Albacete, but losing out on away goals. River had sixth and thirteenth place finishes before the 2016-17 season ended in relegation back to the Tercera División under manager Pablo Turrillas. Sestao River Club will play in Tercera División Grupo IV in the 2017-18 season. My long weekend in Bilbao and the Biscay region had just begun after landing at Bilbao Airport, taking a bus into the city and visited the home of Barakaldo CF. After taking a train from Urbinaga to Sestao I came out in a busy and pleasant little town centre. Walking past the Parroquia de Santa María church on Kasko Plaze I headed uphill on Alameda las Llanas Kalea with its several local bars and shops. Las Llanas looked a substantial and interesting venue, but the gates were locked. I tried several places, but there was no way in. I managed to get some shots through gaps in the fencing before heading round to the far end on Calle San Diego Kalea. This was below the level of the ground because of the undulating area, and once again I had no luck, so I headed off to my next venue; the home of Portugalete Club. Being of stubborn persuasion, I was not going to submit having not got inside Las Llanas. I’d contacted a fan through social media who’d liked my initial Tweet and phots, and he suggested that the ground may be open on Saturday before the team headed to Arenas Club de Getxo for their local derby? Once out of bed I grabbed a panini and jumped back on the Metro from Abando station and then retraced my steps when alighting at Sestao. I was out of luck again, but it wasn’t a total failure. I’d been a bit tentative the previous day, but now it was all or nothing. Much to the astonishment to a group of middle aged and elderly locals waiting for a coach trip, I stood on a bench in the street to enable myself to see over the wall behind the goal and get a view to take photos. It really was a stadium full of character. An indoor pelota hall took up space towards the corner down one side. The rest of the touchline was occupied with a covered terrace of decent size with a glassed area at the rear. The near goal was open terracing, as was the far end. The far side was taken up by a full length seated stand, from where I also managed to get some shots through the side of an exit gate. It was built into a natural hill. Much of the paintwork was in Sestao’s green and black colours. Once again I had a look all the way around, but that was as good as it was going to get. I headed back to the Metro to catch a train to Casco Viejo and watch some football action on top of the hill at Mallona. Sestao was firmly penciled in for a home match visit if I ever returned to Bilbao.